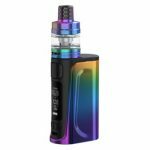 The Eleaf Lexicon is a quirky and weighty 235w kit which carries its stylish battery design from high end gaming PCs. With a high output power, and atomizers able to withstand it, the Lexicon is able to produce masses of vapour. Featuring unique LED light effects, the kit is sure to attract the attention of the extravagant. The Eleaf Lexicon is for experienced and extrovert vapers that like to be seen making clouds. The Eleaf Lexicon features a fully customizable set of LEDs located around the whole device. Pairing this with excellent build quality and hefty design, the Lexicon is bound to stand out. The multitude of different colour options for the LEDs and many different HW atomizers available for the resin ELLO Duro tank also mean the Eleaf Lexicon is extremely customizable. Behind the highly featured exterior is a dual 18650 device capable of high power and filled with advanced functions. Futuristic styling with customizable intersecting strip lights. Dual 18650 box mod supporting a maximum 235W of power. 0.91 inch monochrome OLED display, with centered 510 connection and upgradable firmware. The exterior of the Lexicon is adorned with LED lights. These multi-coloured lights are customisable in the menu settings and can be suited to match your style. They will also perform different actions depending on the function being performed. The ELLO Duro tank uses HW atomizer heads. Incorporating net / multihole technology which provides more surface area for clean flavour and large clouds of vapour. The Net and Multihole coils are both sub-ohm and ideal for vapers who like to inhale directly. Dual 18650 batteries will power the Lexicon up to 235W of power. 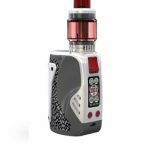 There are a host of output modes meaning this e-cig mod is suited to all vaping styles.